Please click here to go directly to THINCS website, where all details of the book's availability can be found. The book is a collection of chapters written by 21 members of THINCS (The International Network of Cholesterol Skeptics) and edited by Paul J. Rosch, Professor of Medicine and Psychiatry at New York Medical College. Each author is a world-renowned expert on the subjects covered in their respective chapters. The book is also a tribute to Dr. Uffe Ravnskov, who has worked tirelessly for many years to expose the cholesterol myths - publishing more than 150 scientific papers challenging the dogma surrounding the causes of heart disease. Immediately obvious is the breadth of subjects covered in the book. Subjects include: the origins of the cholesterol hypothesis, detailed discussions of the clinical trial data and the many ways that this data has been manipulated by the companies sponsoring the trials, detailed analysis of statin adverse effects, research into the real causes of heart disease and the actual mechanisms involved, and nutritional considerations. The book is aimed at both doctors and the general public. Some chapters do make use of some technical medical terminology. However, I believe the authors felt it was necessary to go into some detail with some topics in order to combat the misinformation perpetuated by medical opinion leaders who are in the pockets of the drugs companies. For decades, we have been subjected to the false idea that fat and cholesterol cause heart disease. And it is not an exaggeration to say that the clinical trial data where statins are concerned has been poisoned by those with vested interests. This book provides the antidote. Several chapters expose the way that the clinical trial data has been carefully distorted in order to exaggerate the benefits of statins and downplay the side effects. The book explains, for example, that 1000 people have died during the last 7 years due to rhabdomyolysis as a direct result of taking statins. 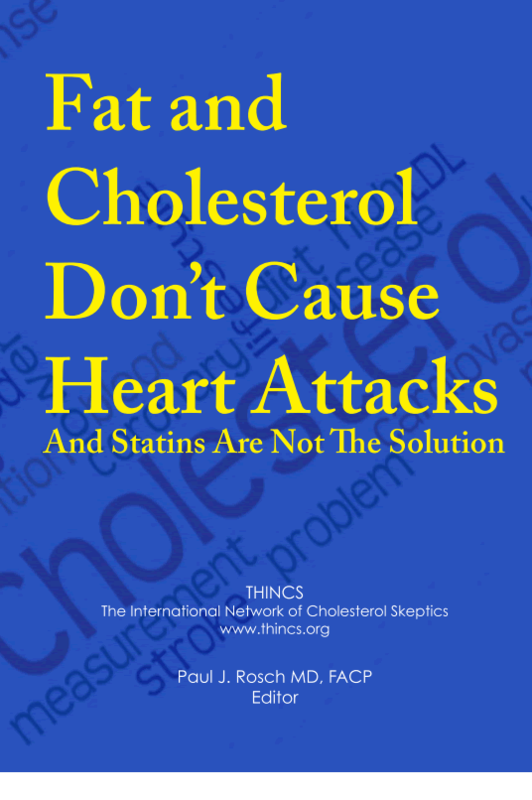 And statins cause arterial calcification - the very thing they are supposed to prevent. My favorite chapters include: Cardiovascular Disease Is Primarily Due To Blood Clotting, Why Reported Statin Side Effects Are Just The Tip Of A Titanic Iceberg, and People With High Cholesterol Live Longer. I also enjoyed reading about how Dr. Uffe Ravnskov became involved in exposing the cholesterol myths and establishing THINCS. It is interesting to read how Dr. Ravnskov was trying to correct the dogma that existed in other areas of medicine before taking up the cholesterol issues. It is clear that Dr. Ravnskov has exhibited the highest level of integrity and pursued the truth throughout his medical career, regardless of the personal struggles that this inevitably created. This is also true of many other THINCS members. Much of the information contained in this book is not easily available elsewhere, since many of the authors have summarized research they have been conducting for decades. It is certainly a unique book and it should be read by anyone who would like to gain a comprehensive understanding of the falsehood of the cholesterol hypothesis and the fraudulent basis for convincing tens of millions of people to take a statin drug that they almost certainly never needed. I am very grateful to Professor Paul J. Rosch for taking the initiate to compile this information, that would otherwise be difficult to find. Professor Rosch also makes considerable contributions to the book.